Home » » KERALA - THE DELUGE AND AFTER. KERALA - THE DELUGE AND AFTER. “It is true that we have fallen down due to the unexpected attack of torrential rain and flood havoc. But we are not going to lay down there crying. We will stand up and face the challenge. We shall overcome this unprecedented situation. We shall survive and rebuild a new Kerala. For that we want help from all those who love Kerala and its people” - These are the words of Com. Pinarayi Vijayan, Hon’ble Chief Minister of Kerala. True to his declaration, under his dynamic leadership, the entire people of Kerala, irrespective of caste, religion and politics have joined hands together and are in the process of rebuilding new Kerala. Thiruvananthapuram City is less affected by floods. In the Karamana area of the city where myself and family is staying, knee-level flood water has come to the road from nearby Killi river, due to torrential rain and opening of shutters of Neyyar dam. Many other places in Trivandrum District were submerged and hundreds of families shifted to relief camps. The worst affected districts are Pathanamthitta, Alappuzha, Kottayam, Idukki, Ernakulam, Thrissur, Palakkad, Malappuram, Kozhikode, Wayanad and Kannur. I had an opportunity to participate in the relief and rehabilitation work. We, under the leadership of Com. 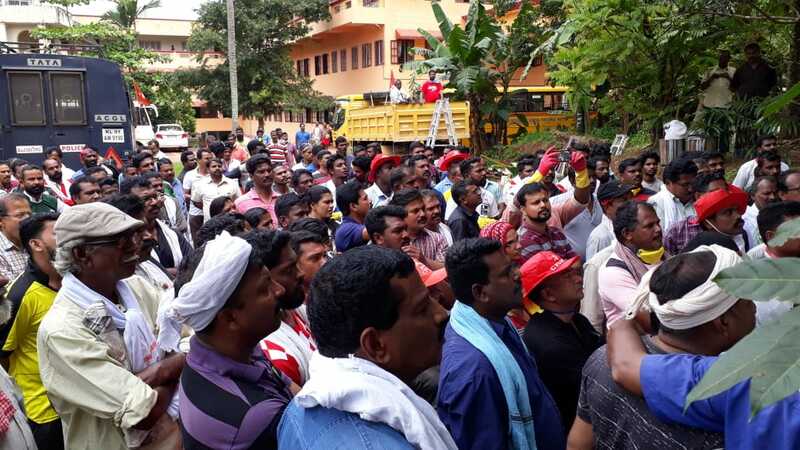 Anavoor Nagappan, District Secretary of CPI(M), Trivandrum District went to the flood devastated Pathanamthitta District, about 250 kilometers away from Trivandrum City. We were 450 volunteers including 52 women, technical experts, electricians, masons, carpenters, IT professionals and also two ambulances with medical team. We reached Tiruvalla on 26th April 2018 morning 9 o’clock in a bus and carried out the relief and rehabilitation work for three days on 26th, 27th and 28th. 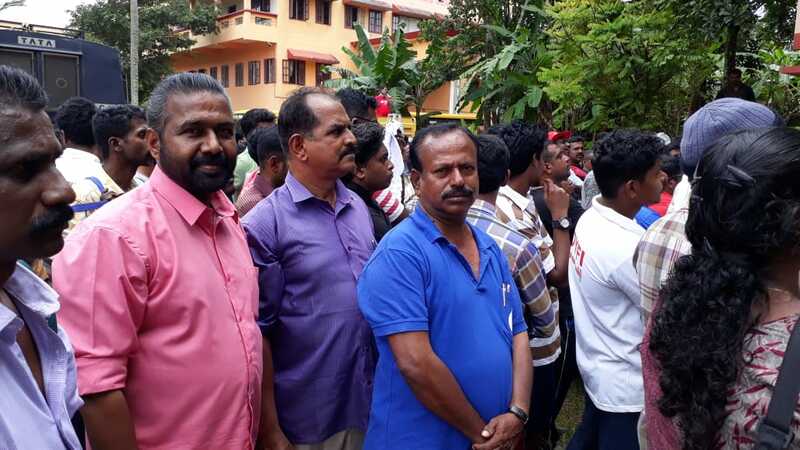 Accomodation and food was provided by the leaders and volunteers of Pathanamthitta District. As the flood has receded, people have started coming back to their houses. 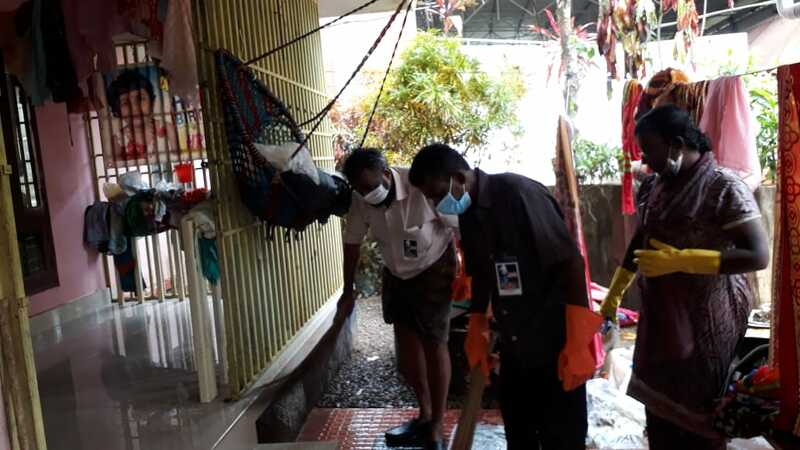 The main work to be done was cleaning, repair, repainting and rewiring of the houses, compounds, roads, temples, churches, schools, Anganawadis, offices, shops, river bank steps, removing of carcasses of dead animals etc. The Panchayath areas allotted to us are the worst affected areas like Niranam, Vengal, Nedumpram, Kadapra, Kuttoor and Peringara. The entire volunteers were divided into ten groups each of 42 to 48 volunteers. Each group is alloted with a village on each day. On reaching the village each group is sub-divided into 6 to 8 teams with a team leader and each team will carry out the cleaning, repair, painting and rewiring etc. of each locality. We were allotted with Nedumpram, Vengal and Podiyadi area adjacent to Alappuzha District and coming under Upper Kuttanad area. All volunteers were given Tetanus toxoid (TT) injection and other preventive medicines, glosses, shoes etc. Each team worked from morning 8 AM to evening 7 PM daily. The cleaning and repair work is an unforgetable experience. The flood-ravaged scenes was really pathetic. Houses badly damaged, some parts collapsed, compound walls taken away by flood, damaged temples and churches, Anganawadis and school buildings, Health Centres, Hospitals, Shops, Post Office and Telephone Exchange buildings, Panchayat Offices, other Govt. Offices - everything was badly affected by floods. Heavy rain with sudden flood and overflowing of Pampa river and Manimalayar (Manimala River) caused panic among the villagers as water level started rising high and many houses andcattle submerged in 12 feet high flood water causing extensive damages. Residents were marooned and stranded. The families, rich and poor, are all shifted to relief camps by rescue boats, and helicopters. Entire household utensils, Television, Books of School/College children, important documents of land, Aadhar cards, ration cards, furniture, cars, two-wheelers - all damaged beyond repair in the flood water which remained for more than ten days. Inside of the rooms were filled with filthy mud full of dirty wastages of about 2 to 3 feet high. During our 3 days relief and rehabilitation work, 450 volunteer cleaned and repaired 1208 houses, seven temples/churches, three Panchayat offices, six schools, three Anganawadis, several shops, by-lanes, roads and made them usable and inhabitable. About eight carcasses of animals were removed. Ten highly poisonous snakes which came from mountain in the river water were caught. Tons and heaps of wastages were removed. After completing the three days voluntary work all of us returned to Trivandrum on 28th night with full of satisfaction. There are thousands of such relief volunteers working in all the flood affected districts and villages of Kerala. 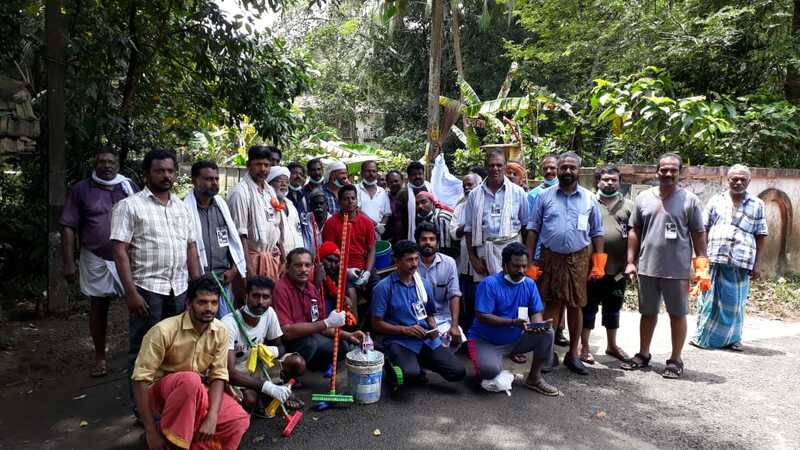 In Alappuzha District, in Kuttanad area alone 60000 volunteers were engaged. As per the official figures 55 lakhs people in 981 villages are affected by flood. The flood that devastated entire Kerala was the worst in the last 100 years. Similar flood was there in the year 1924. The rainy season commenced in May 2018 causing heavy damages to the life and properties of People and turned into unprecedented flood in the month of August. All rivers and 82 dams also overflowed. Even though the Meteorology Department of Government of India predicted in their forecasts only 98.5 millimeters rain during the period from August 9 to 15, the actual rain fall was 352.2 millimeters, ie; three times more. It shattered the life of lakhs of people and they lost everything including houses. 483 people lost their lives, 14 missing, 140 admitted to hospitals in serious condition, 3,91,494families were evacuated, 14,50,707 people were in the relief camps for about 15 days. 57000 hectres of paddy fields and agriculture damaged. Thousands of house hold animals and cattle like cows, goats, chicken, ducks, dogs etc died. Cochin International Airport was closed for about 15 days. Train services and road traffic completely paralyzed, educational institutions, hospitals, Government offices, shops, small scale industries, big industries - all badly affected. Kerala Government has announced three phased action programmes to overcome the flood situation. 1. Relief and Rescue work, which is already completed. 2. Rehabilitation work which is also almost nearing completion. 98% of people who were in the camps returned to their houses. 3. Reconstruction/Rebuilding a new Kerala. This is the most important phase for which huge amount of money is required. Without whole hearted help from all who love Kerala and its people, it is impossible to complete this himalayan task. Chief Minister, Kerala and also the Legislative Assembly of Kerala has requested all those inside and outside Kerala to extend their help in this crucial hours. The relief and rehabilitation work undertaken by the Kerala Government and people of Kerala has no parallel in the world. The unity, commitment, dedication and sacrifice shown are beyond words. The whole world has praised the way in which Kerala faced the flood situation. The main hurdle for the reconstruction work is paucity of funds. Expected amount of relief fund is yet to come from Central Government. So far only 600 crores are given. Further Centre in not in favour of accepting financial assistance offered by foreign countries like UAE. Donations to the Chief Minister’s relief fund is pouring from all parts generously. Chief Minister has requested all workers, employees and teachers to donate one month’s salary towards CM’s relief fund. The response is overwhelming. Each and every one of us should donate maximum amount to the Relief fund so that the task of rebuilding a new Kerala can be accomplished within a shortest period of time.